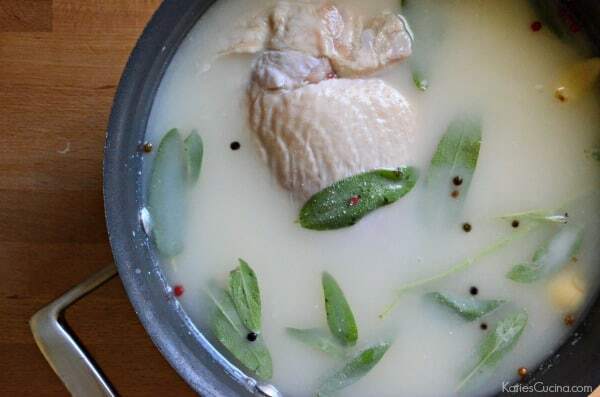 Brine your next turkey with this easy recipe for Buttermilk Sage Turkey Brine. It only takes 5 minutes to make and needs at least 12 hours to rest refrigerated! 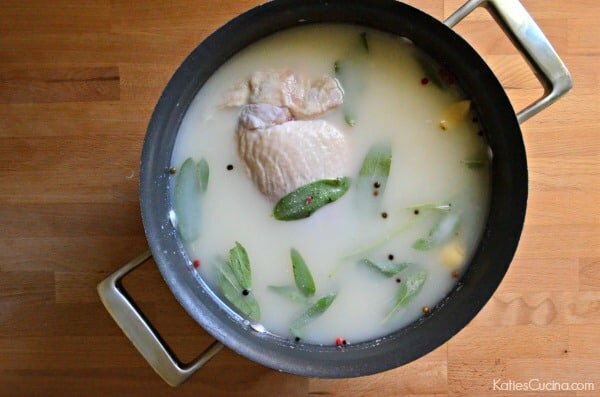 Thanksgiving is right around the corner and today I’m sharing with you my recipe for Buttermilk Sage Turkey Brine. Last year, was the first year I’ve ever brined a turkey. Of course I’ve only hosted Thanksgiving 3 times now which means I’ve only ever cooked 3 complete Thanksgiving dinners. I took a gamble last year and steered away from my mom’s traditional turkey recipe. She wasn’t really happy with my decision and insisted that I only brine one of the two turkey breast in case my brine failed us miserably. Let me tell you that brining a turkey can be a little tricky in a brining bag and especially so when your 6 months pregnant like I was last Thanksgiving. If you choose to brine in a brining bag, I highly suggest you have an extra set of hands in the kitchen to help. I did and I was so thankful for the help. After my turkey brined and baked side-by-side to my mom’s traditional salt/pepper/butter turkey it was time for a turkey taste-test. The family lined up and tried a piece of each and everyone (minus my mom) agreed that the brined turkey was much more flavorful and juicy. I had heard all of my friends raving about brining a turkey and I’m glad I’ve joined the brining band-wagon. After brining last year I don’t think I’ll ever go back to the “traditional” way again. So you might be wondering what makes a brine so special? According to Fine Cooking, leaner meat like a turkey, when overcooked by just a few minutes can tend to dry out rather quickly. When you brine the meat it can reduce the moisture loss by as little as 15%. So in a nut shell the brine helps protect your turkey in the event that it is over cooked–keeping the coveted prized bird nice and juicy. This recipe was created for a 6.5 lb turkey breast. If using for a larger turkey double, triple, quadruple recipe as needed. If you do not have a pot large enough to brine the turkey you can use a brining bag. Mix all ingredients in a bowl, place turkey in brining bag and then pour the brine over the turkey. Place a large bowl/ cupped plate and/or pot underneath brining bag in case of leaks. So if you’ve never brined a turkey before. I challenge you to try it this year. I promise you this recipe will not fail you and will result in a plump and juicy turkey on Thanksgiving day! 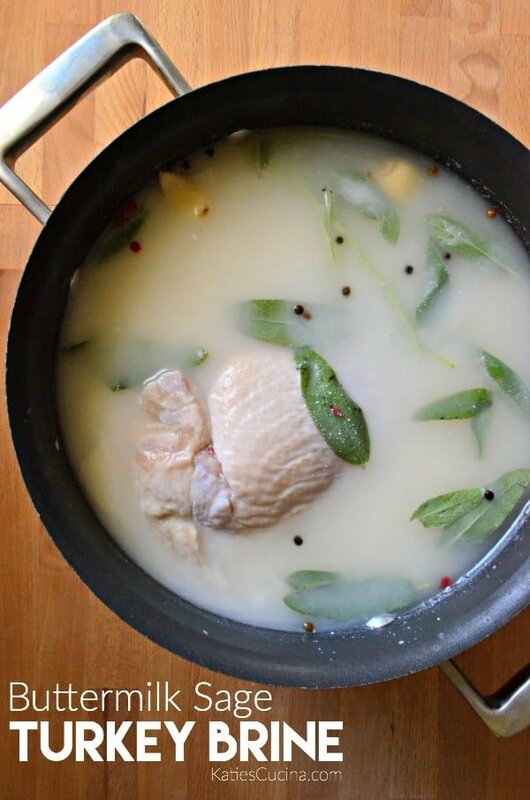 Place kosher salt, whole peppercorns, fresh sage leaves and garlic cloves in a large stock pot (large enough to cover your turkey breast with a lid on). Then pour in warm water. Whisk water until salt has dissolved (about 2 minutes). Pour the buttermilk into the pot. Whisk again then place the turkey inside the pot. Turn the turkey breast so that only a small piece is exposed. Place lid on pot and refrigerate for at least 12 hours no more than 24 hours. After turkey breast has sat in brine for at least 12 hours. Rinse turkey breast off thoroughly and pat dry before baking. This recipe was created for a 6.5 lb turkey breast. If using for a larger turkey double recipe as needed. *If you do not have a pot large enough to brine turkey you can use a brining bag. Mix all ingredients in a bowl, place turkey in brining bag and then pour the brine over the turkey. Place a large bowl/ cupped plate and/or pot underneath brining bag in case of leaks.